European Internet users, as well as clients in other parts of the world were afflicted by the Win32/Conficker worm that has reached an especially high rate in the Ukraine � 24.99% and similarly high occurrence in Russia (18.39%). Other countries afflicted by it include Serbia (9.11%), Bulgaria (16.55%), Romania (12.74%), Hungary (7.15%), Germany (7.18%), United Kingdom (6.59%), Italy (8.68%) and Republic of South Africa (17.32%). INF/Autorun was the most often detected threat by ThreatSense.Net in Ireland (6.84%), Israel (3.42%), Latvia 4.06%) and Slovenia (4.24%). From a local point of view, the threat that has registered as No. 3 globally - Win32/PSW.OnLineGames - ranked No. 1 in Turkey (15.17%),Slovakia (9.22%), Poland (16.45%), France (10.23%), Spain (10.14%) and Greece (7.91%). Aside from the famous types of malware, the users in Europe were also exposed to worms targeting social networks, such as Facebook, MySpace and Twitter. 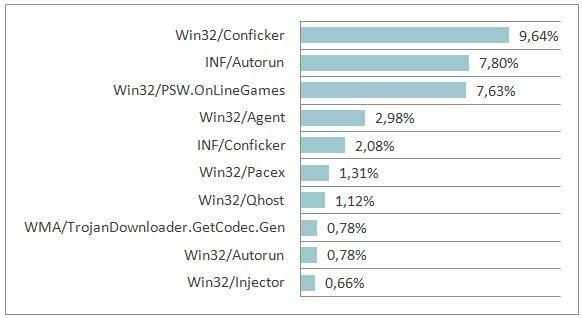 Variants of Win32/Koobface with 3.57% share have ranked among the top 3 in Austria, a higher infiltration rate than caused by Win32/Conficker in this country. Win32/Koobface has also been ranked among the top 3 threats in Norway (4.33%), Denmark (2.25%) and Israel 2.46%). For the month of November 2009, Win32/Wigon is the most widespread type of malware appearing in the Czech Republic (3,52%) and Austria (5,45%). It�s aim is to download other malicious content into the user�s PC via encrypted files. The program does not store these malicious files on the disk, instead it inserts them directly into the running processes. Wigon has been known to create an exceptions in the firewall in order to evade detection. ESET ThreatSense.Net� has also registered a high occurrence of Win32/Peerfrag.EU � a variant of a worm spreading via exchangeable media and through P2P programs. It affects mainly programs, such as DC++, eMule, Kazaa and LimeWire. Win32/Peerfrag is the most widespread threat in Estonia with a share, of 6,89%. It is also among the most widespread threats in Sweden (1,56%) and Iceland (1,40%).